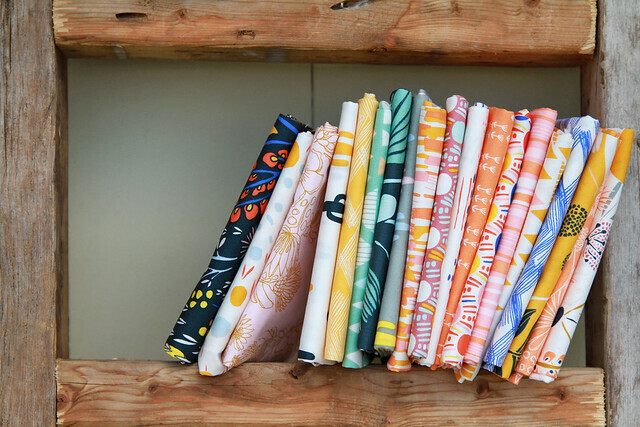 For this week's Fabric Giveaway Friday, the Knotted Thread is offering the winner a beautiful Fat Eighth bundle of Leah Duncan's newest fabric collection for Art Gallery Fabrics, Morning Walk! This bundle will include a fat eighth cut of each of the 20 fabric prints that make up this wonderful new collection! You can find Morning Walk available in The Knotted Thread's Shop as a Fat Eighth Bundle, a Fat Quarter Bundle, and a half yard bundle here!! That’s 4 possible entries! Enter now through Monday, March 23rd!! Winner will be picked at random and I will announce their name at the bottom of this post, here on the blog! Comment #230 -- * Amy Harward * Congratulations, I'll be in touch shortly! What beautiful fabrics.......I will run over there now. Love Leah Duncan! Her fabric is always so pretty. I already receive The Knotted Thread newsletter. What a gorgeous bundle! The colours! i follow you on facebook, instagram and by email! 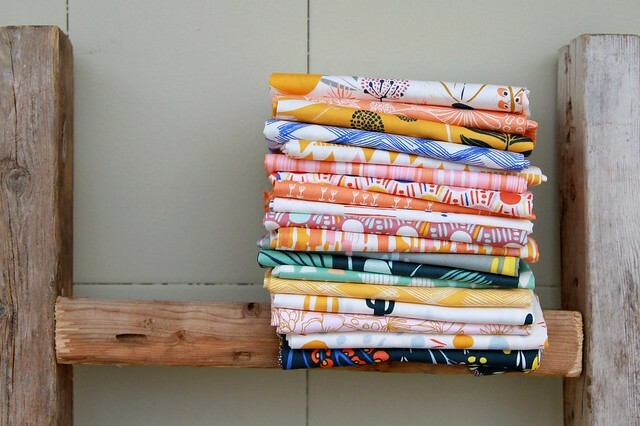 I adore Leah Duncan's fabrics! Perfect for nursery decor! I need it! I love the pretty spring colors! I am so ready for some spring!!!! Lovely fabrics, and love Art Gallery! That looks like a beautiful collection! Thanks for the chance to win! Love the fresh designs and colors of this new collection! Thanks for the opportunity. I follow you on Facebook, bloglovin and Instagram. I follow Knotted Thread and love their fabric and the fantastic customer service Jennifer gives. I so love your designs Maureen. I also signed up for Knotted Threads newsletter. Thank you Knotted Thread! This collection looks beautiful! Thanks for the opportunity to win it! Thank you for the chance to win -- it would be so fun to sew with this collection! I follow you, and always enjoy looking at your work. Thanks! These are so gorgeous, I hope I win!! Gorgeous colors! Would love to win! Your giveaways are the best! Each one tops the last one. Oh yaaaay! I've been waiting for this collection! I LOVE Leah Duncan. Thanks for the chance Maureen. Cheers! I follow you on fb, instagram and the blog o bloglovin! Love this fabric! Great give away! Thank you! I signed up to get The Knotted Thread's newsletter! I follow get knotted thread newsletter and follow on IG. I follow you on Facebook, IG and your blog. Leah Duncan is hands down one of my all time favourite designers! I love the pillows you have been posting. So cute! I subscribe to Knotted Thread newsletter. All signed up for Knotted Thread newsletter. I love the fabric! I wold love to win this. Thanks for the chance. I haev signed up for the knotted fabric too! Great site for Knotted Thread. Reposted and shared on IG! Love the colors in this collection - thanks. I'm already subscribed to the Knotted Thread newsletter - thanks. I'm a follower of your blog with Bloglovin' - thanks again. OHHH and lastly I'm an Instagram follower 😜 which is how I heard of the giveaway! Ok chao! Bright sweet colors. Would love to have them. I pinned this on my Giveaway Board (scrapperdeb). I would love to win! TY!!!!! What a bright, springy bundle! I would love to get my hands on this fabric. It is super cute. Oh, I just LOVE these fabrics! Thanks for another great giveaway! Those are lovely fabrics-a really nice Spring collection! I am already signed up for the Knotted Thread's newsletter. That sure is a beautiful bundle. Such a pretty line! Love it! I love all things Art Gallery. Gorgeous Fabric. I follow you on instagram and your blog. Love them. I shared your post via instagram with my good quilting friend. Pretty fabrics - I could use some Spring in my fabric stash! Already follow you on Instagram and love your Wild and Free fabric!! Love the Mesa fabric. Signed up. Shared and follow you everywhere ..ha ha ha..stalker...love. Thanks for letting us enter! I've been looking forward to this beautiful collection! Doesn't make it to my local shop until April. I can't wait! Pretty fabric! Thanks for a chance at owning it. What a beautiful collection! Thank you for the giveaway. gorgeous fabrics! thanks for the chance to win these! Thanks, as always! You have amazing sponsors. I signed up for the Knotted Thread newsletter! I like the colors of this collection. Thanks! I am subscribed to the Knotted Thread newsletter. wonderful line. Thank you for the giveaway! I follow you on IG and FB. Thanks, Maureen and Knotted Thread! Here's my "I adore this fabric" entry! Here's my "I Signed up for the newsletter" entry! Here's my "i follow you on Instagram at @theLadyLiles" entry! Here's my "I shared this adorable bundle" entry! Love this fabric! Thanks for the chance to win!